Place kale leaves in a bowl and sprinkle with the oil, nutritional yeast and remaining sea salt to taste (plus other spices, according to your taste). Gently toss all the ingredients. 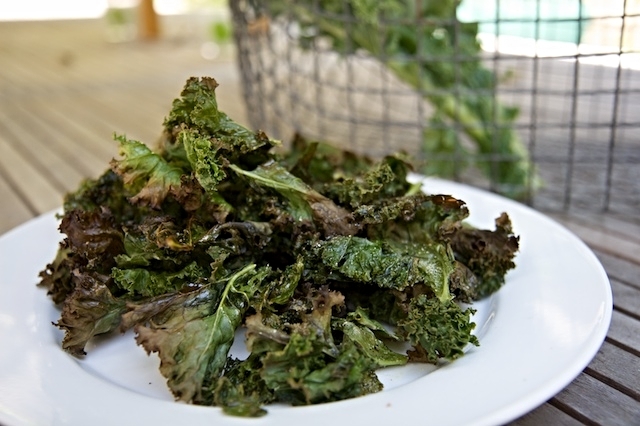 Place your kale leaves on the dehydrator sheets (or trays). For the first hour, dehydrate at 145°F, then turn the trays around and lower the temperature to 115°F. Check them in another hour and either remove or keep dehydrating to your desired crispiness. Serve your kale chips immediately! If you use a dehydrator you will have a great result, but you can also try with you oven.